While the 1960s saw plenty of action from American LSR legends like Craig Breedlove, Mickey Thompson, and Art Arfons, it was a friendly older gentleman from New Zealand, Burt Munro with an old (heavily modified) Indiana motorcycle that stole everyone's hearts. Even folks unfamiliar with LSR racing saw the movie World's Fastest Indian and became fans of Burt and his bike. 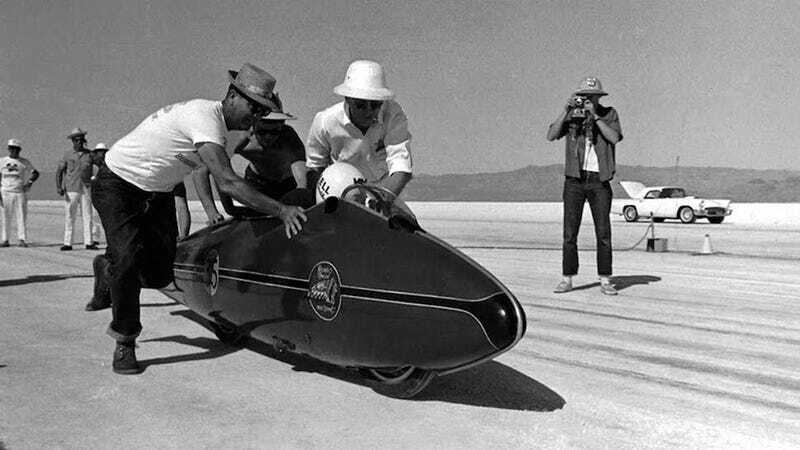 Well, Burt's little Indian may not be the fastest in the world this time next year if these college kids from Queen's University succeed in building a specially-engineered motorcycle to break his 1967 land speed record. Burt Munro fan? See more incredible photos like above from his very first trip to Bonneville on Roadtrippers.